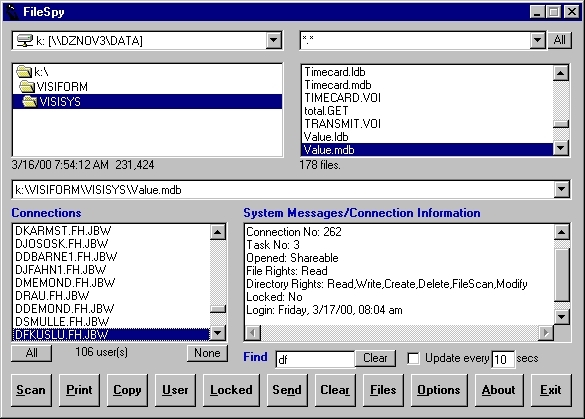 FileSpy allows users connected to a network with Novell Netware to see all the users who are using a specific file. It also allows viewing of the user's rights to the file/directory, how the file was opened, the user's network address, and the date and time the user logged in to the network. With FileSpy you can also send messages to selected network users and if you have administrative rights you can even clear their connection. Qweas is providing links to FileSpy 3.0 as a courtesy, and makes no representations regarding FileSpy or any other applications or any information related thereto. Any questions, complaints or claims regarding this application FileSpy 3.0 must be directed to the appropriate software vendor. You may click the publisher link of FileSpy on the top of this page to get more details about the vendor.